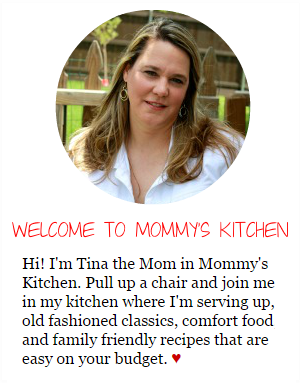 Mommy's Kitchen - Recipes From my Texas Kitchen: Snickerdoodle Crispy Treats & Shopping The ALDI Way! 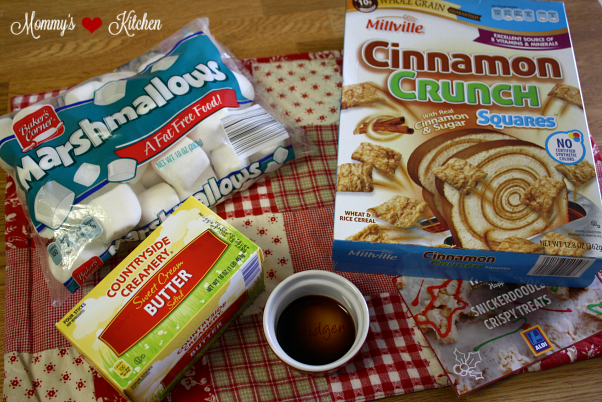 Snickerdoodle Crispy Treats & Shopping The ALDI Way! I've been a loyal ALDI customer for over 10 years. When I lived in Mesquite, TX I frequently shopped my local store, but 6 years ago we moved to a new town and the nearest ALDI was so far out of my way. I was a little disappointed because ALDI is the perfect supermarket for families on a budget. Well, 4 years ago a new ALDI opened in the town next to me (Rockwall, TX) and I was beyond excited to be shopping at ALDI again!!!! Since the bulk of my shopping is done at their store, I was very happy when ALDI reached out and offered to send me an ALDI Delivered Box filled with samples to try. When my ALDI box arrived at my doorstep it was filled with a variety of items. They sent me four holiday recipe cards from their ALDI Test Kitchen, an insulated grocery tote, information on new available products, and a quarter for my shopping cart. I also received a variety of non-perishable ALDI brand products and a shopping list of the remaining ingredients to assist me in making each of the recipes. 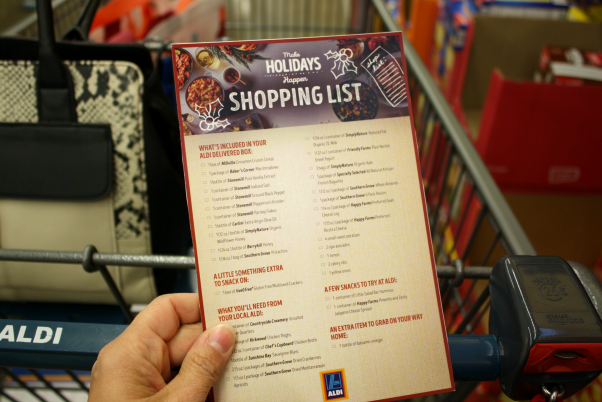 Before I dive into which of the holiday recipes I made, I want to share some helpful information about ALDI. If you're not familiar with ALDI here's a bit of a break down, so you too can start saving money with their affordable prices. 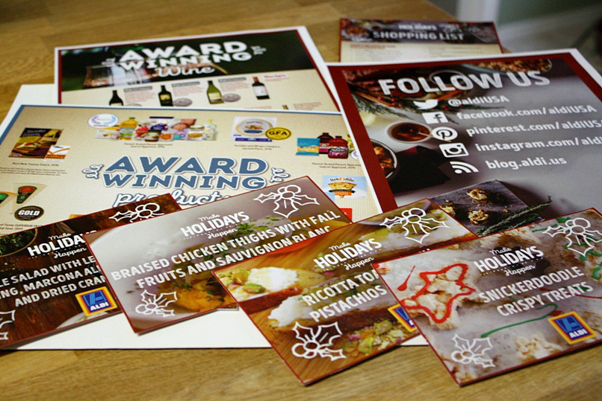 ALDI is a small format supermarket that saves shoppers money and offers high quality foods. 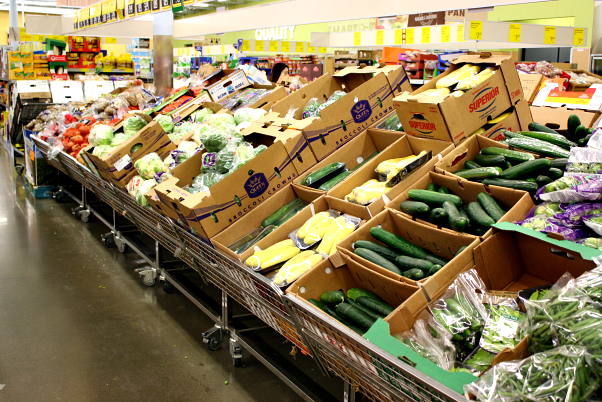 They carry fresh meat, pantry staples, dairy, produce, household, baby and seasonal items. 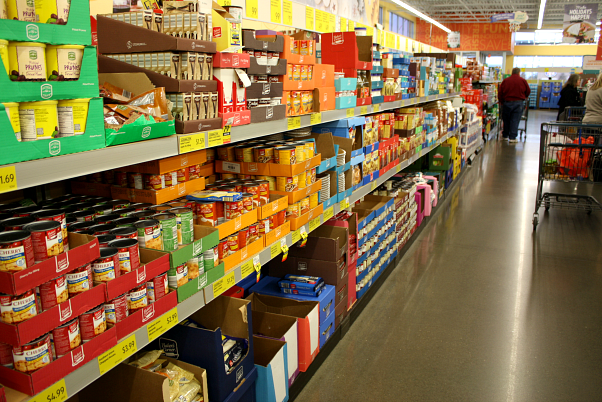 You won't find many brand names at ALDI because about 90% of ALDI products are private label brands. They do have a few national brands mixed in, but for the most part ALDI stocks their own high quality exclusive brands to save shoppers money. 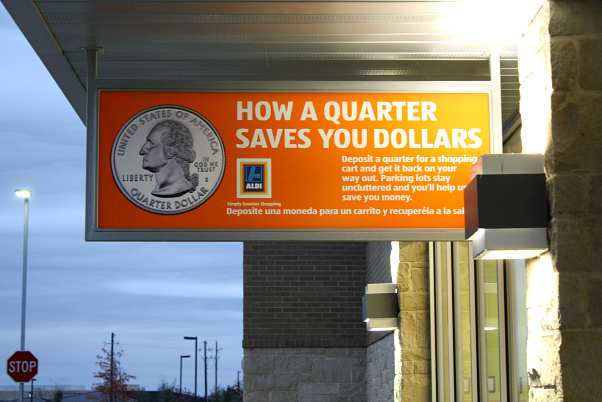 ALDI uses a shopping cart rental system, so make sure to bring a quarter if you plan on using a shopping cart. When you arrive at the store all the shopping carts are kept in one convenient place. ALDI uses this system to prevent grocery cart clutter in the parking lot or the need for employee's to retrieve carts. 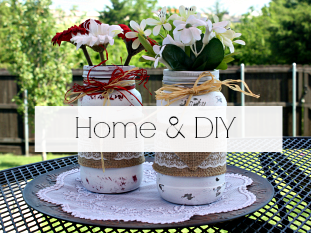 This saves time and money because the staff can focus on serving customers inside the store. It's a genius idea if you ask me! 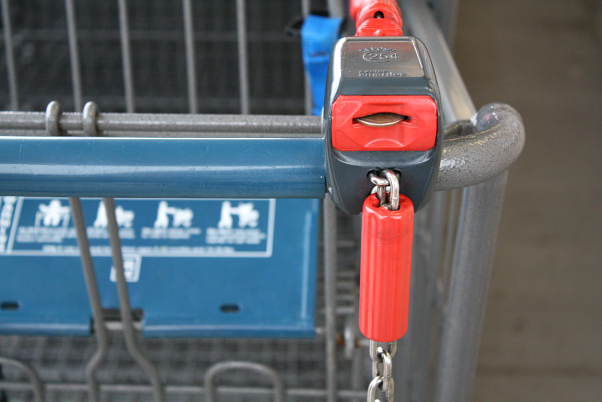 To use the shopping carts you will need to deposit a quarter into the cart slot to release the cart. No worries because once you're done shopping, simply return the grocery cart back with the others and you'll get your quarter back. I always keep a quarter in my reuseable shopping bags so I have one on hand. Sometimes I return my cart and just leave the quarter in the slot for the next shopper. I myself have been stuck a time or two without a quarter and a nice "quarter fairy" has left one in the cart for my benefit, so I try to pay it forward from time to time. You will also need to bring your own grocery bags or you can purchase bags at checkout. I usually just leave my reuseable bags in the trunk of my car because I never know when I'm going to pop in for a visit. 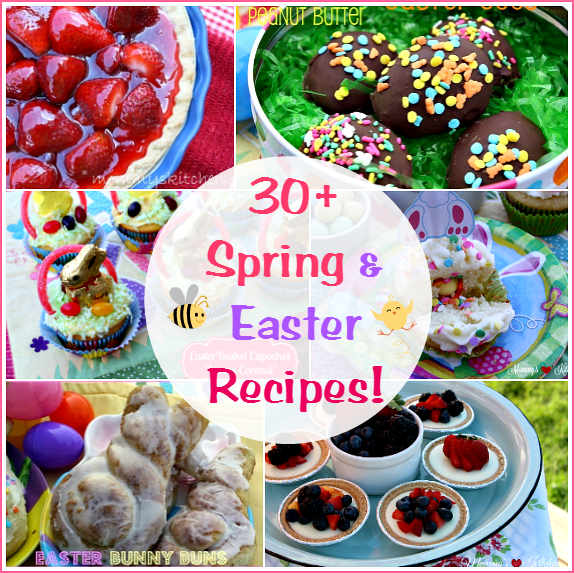 Once I had my shopping cart and grocery bags I was ready to shop for all my ingredients. I have to admit I did get a bit side tracked as I always do when I grocery shop, so I definitely came home with way more than I planned on getting. When you first walk in to an ALDI store you will notice a few things right off the bat. The store has a smaller layout, wide aisles and each row is packed with bargains. You'll find the current weekly ad flyer at the entrance of the door and when you leave you can pick up an ALDI ad flyer for the following weeks sales. ALDI also doesn't have any fancy shelving and keeps products right in their display boxes. 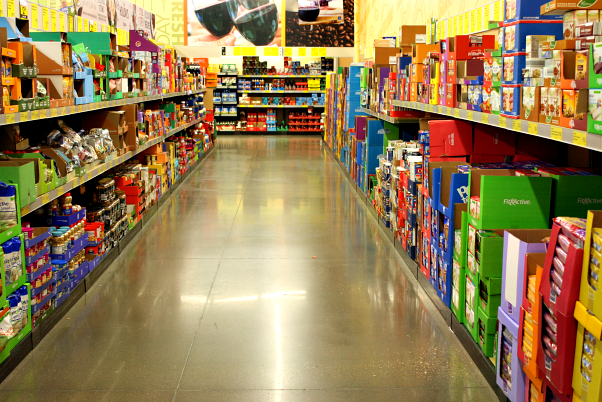 This frees up workers from having to constantly stock the shelves, saving time and money. Pricing is always clearly visible above or below the available products. ALDI also has smart packaging to get you in and out the door in no time. Each of their products have multiple bar codes so scanning is super fast at checkout. Their produce section is one of my favorite areas of the store. 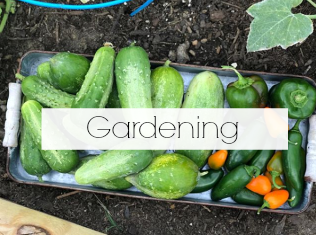 ALDI carries a wide variety of the freshest in season fruits and vegetables, including some organic produce at the lowest prices. Seriously folks their produce prices are extremely hard to beat. A few of my favorites are, in season berries and strawberries ($o.99 for 16 oz package), whole pineapples for $0 .99 each, asparagus, broccoli, squash, and sweet mini peppers. Their produce signage and prices are clearly listed above each of the produce bins, so I never have an issue finding a price for any of their produce. You will also find great deals on various baking products like, Simple Nature All Purpose Organic Flour, Bakers Corner Granulated Sugar, Simple Nature Cane Sugar, Simple Nature Cake Mixes, Bakers Corner Chocolate Morsels, Stonemill Extracts, Bakers Corner 100% pure canned pumpkin and more. Their Baker's Corner brand is one of my favorite baking brands and one I used on a regular basis. 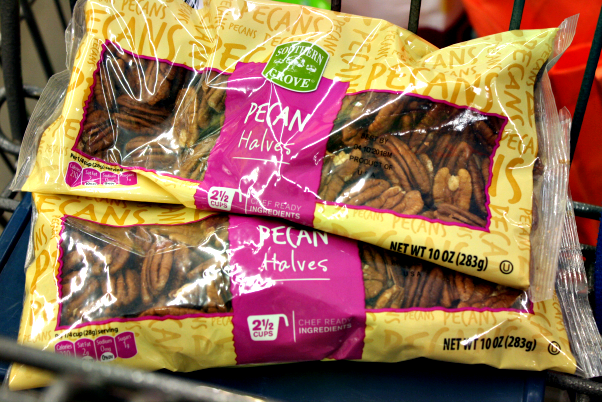 ALDI carries a variety of nuts, but their Southern Grove Pecans are one of my favorite finds!!! 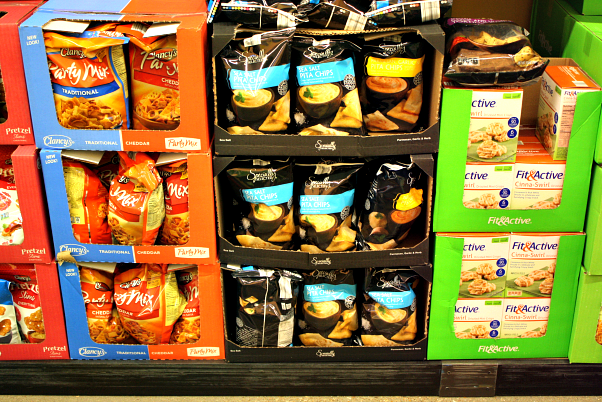 Each 10 oz package is priced at $3.99 per bag and definitely the cheapest in town. Other retailers offer the same item for $2-$3 more for the same size bag. I always grab at least two packages on any given grocery trip. 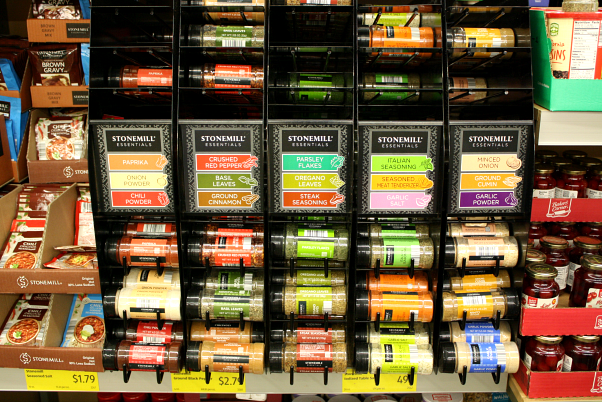 Stonemill Spices are also a great steal starting at $0.99 for your basic spices and a bit more for specialty spices. Still lower than other retailers. ALDI carries a variety of wine at great pieces. Just look at all the choices. 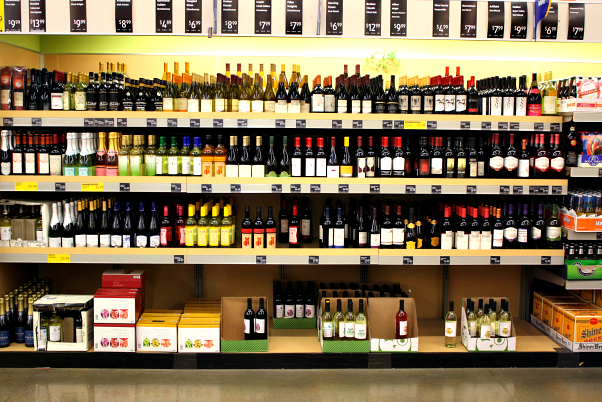 They have seasonal wines, red, white, sparkling, specialty wines and even wines of the month. Check with your local ALDI because not all stores carry alcohol. 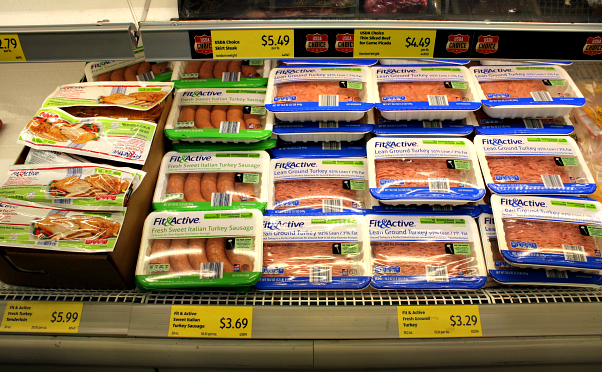 ALDI offers a good variety of lean cuts of beef, chicken, pork and sausage at very affordable prices. 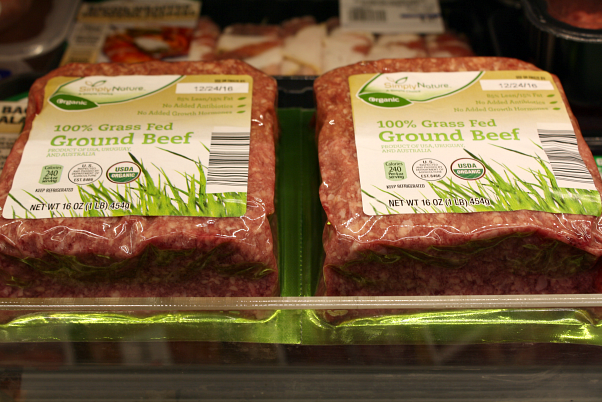 They also offer SimplyNature 100% Organic Grass Fed Ground Beef in convenient vacuum sealed packages. The SimplyNature Grass Fed Ground Beef has no added antibiotics, no growth hormones, no artificial ingredients and it's minimally processed. If you're looking for Organic products ALDI offers their SimplyNature line. 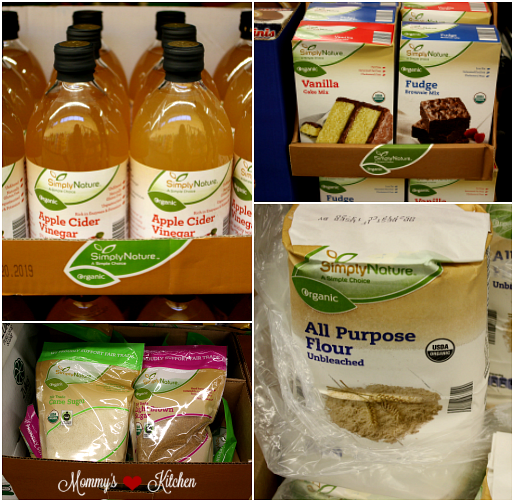 Besides the many organic products they carry a full line of gluten free products in the liveGfree line. I have just started to dabble into organic products, so I was pleasantly surprised at the various organic products and how affordable they were. A few of my favorites are, SimpleNature Organic All Purpose Flour, Simple Nature Organic Cake and Fudge Brownie Mix and SimpleNature Organic Cane and Brown Sugars. 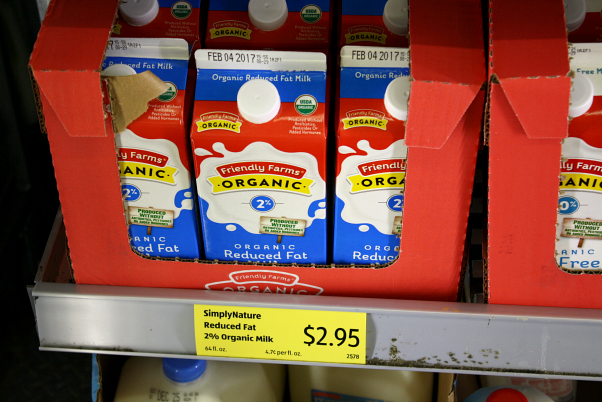 They have Friendly Farms Organic Whole and 2% Milk offered for $2.95 and also carry a variety of lactose free, soy and almond milk varieties. 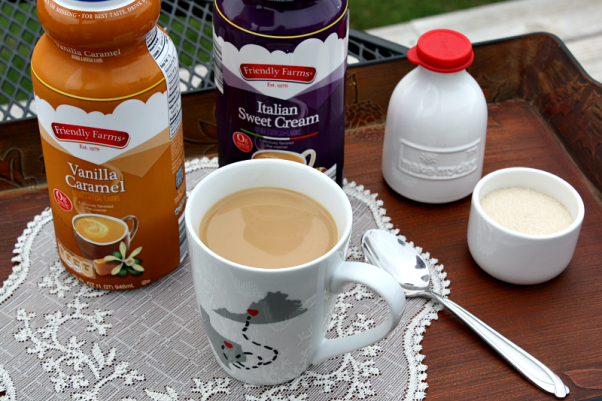 Friendly Farms Italian Sweet Cream Creamer is my absolute favorite, so I usually grab at least two bottles on any given grocery trip. All of their creamers are delicious and affordably priced at $2.19 for a 32 oz bottle. The same creamers are $3.99 at other retailers, so the ALDI creamers are a steal and they freeze well, so stock up. 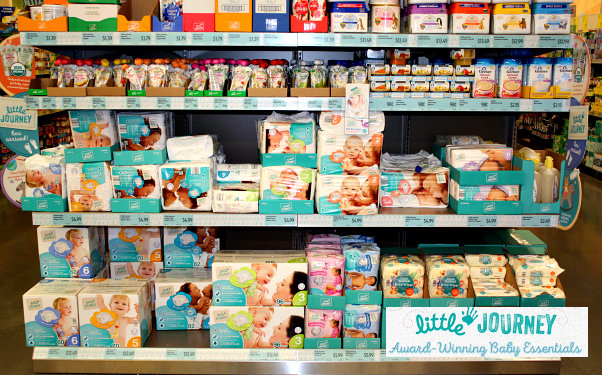 If you have a baby you seriously need to be shopping at ALDI, because they offers a wide variety of affordable Little Journey baby products. They have diapers, wipes, formulas, bath products, organic foods and snacks at the lowest prices. My kids are older, but I sure would have loved an ALDI near me when my kids were babies. ALDI prices on baby products are so low that you can easily stock up on several items. 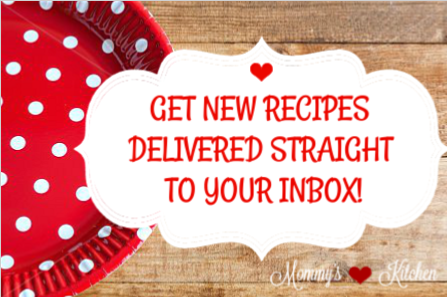 Now onto the holiday recipes I chose to make. First on the list are these Snickerdoodle Crispy Treats made with Millville Cinnamon Crunch Squares, Bakers Corner Marshmallows, Countryside Creamer Butter and Stonemill Pure Vanilla Extract. I added holiday sprinkles to give them more of a festive look. Melt butter in a large pot over low heat. Add the marshmallows and stir until completely melted. Remove from heat and add the vanilla extract. Stir in one cup of cereal and mix until thoroughly coated. Add more cereal and stir until all of the cereal is coated with marshmallow. Pour into a greased 8 x 8 inch square pan. 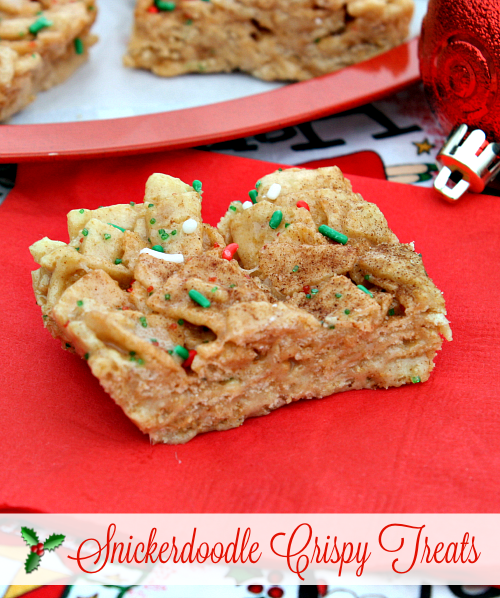 Add holiday sprinkles over the top and cool completely before cutting into shapes or bars. 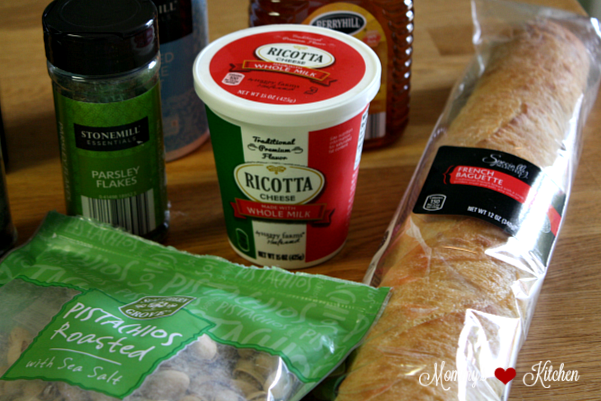 I also purchased everything I needed to make these Ricotta Toasts with Pistachios and Honey. 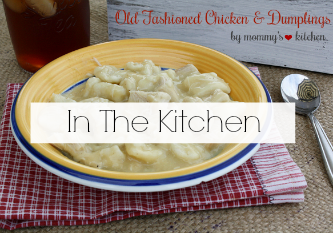 This recipe was so easy and from start to finish it took no time to make this delicious holiday appetizer. These little ricotta toasts would be perfect for Christmas or New Years Eve. Check out the recipe below. Preheat oven to 400 degrees. Cut each slice of bread in half. In a medium bowl, toss with olive oil. I used the small baguette, so I just sliced the bread across diagonally. Season to taste with salt and ground black pepper. Add parsley flakes and toss bread until coated. Lay each bread slice on a baking sheet in a single layer. Toast for 4 minutes, flip and toast for an additional 3 minutes or until light golden brown. In a small bowl mix the ricotta cheese with 3/4 teaspoon salt and 3/4 teaspoon pepper. 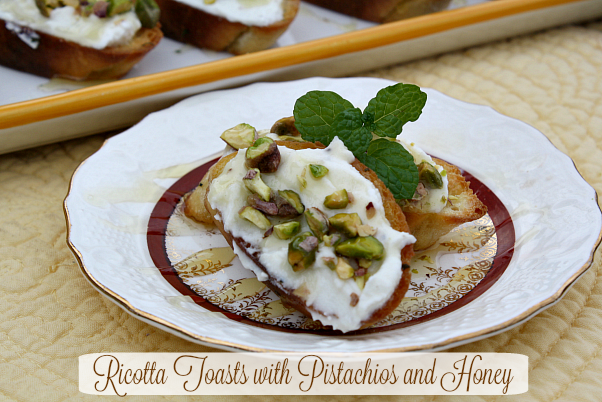 Spread ricotta onto each piece of toast, sprinkle with chopped pistachios and drizzle with honey. Serve immediately. You can also stay up-to- date on ALDI's latest offers and weekly ad with their Mobile App. The ALDI App is available for iPhone or Android. 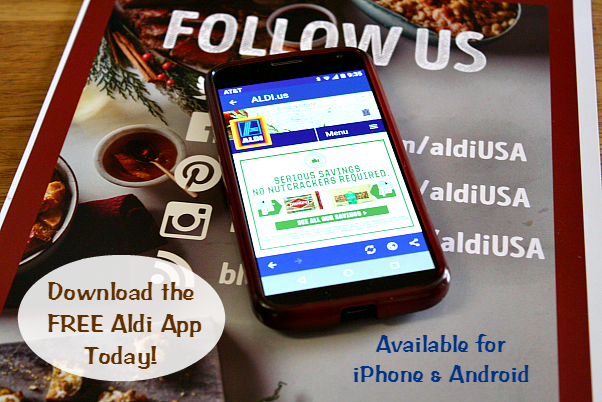 Download the ALDI Mobile App here. Do you shop at ALDI? 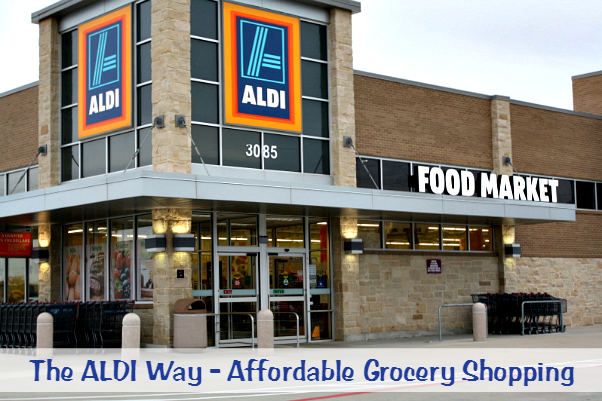 If not make your next grocery trip an ALDI Experience!! 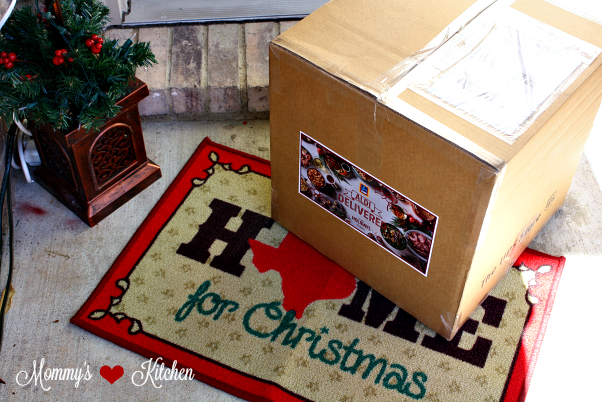 As part of my partnership with ALDI, I received an ALDI Delivered box as a fun way to sample and review products and recipes. This is not a new delivery service. You know; I have never set foot into an Aldi store, not that I haven't wanted to; just one of those things that I never took the time to do so but will be making a point to do so real soon. I like Aldi's and shop there regularly for basics. Just bear in mind that you wll not find some of the items on your list as they keep to popular, high volume items. The other thing to note is that they have pricing differences by area. I have an Aldi's west of me and east of about the same distances and the prices vary . 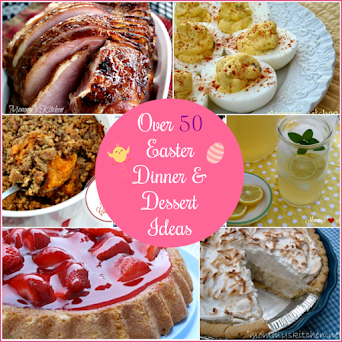 The one that very much stands out in your post is the pecan price. In my state those pecans would be at least double or even triple in price. We pay that for an eight ounce bag. I love saving money by shopping at Aldi! I have tried many of their brands and most are comparable to name brands that cost more even when using a coupon! Their peanut butter filled pretzels are to die for and so much cheaper than other stores. Their cream cheese is often on sale for $.89 and you can't tell the difference from the popular name brand. You can't beat their produce prices-you can buy organic cheaper than regular produce at grocery/chain stores. They are constantly restocking items-which makes me happy. plan to stop there soon. Have a Merry Christmas! @Colleen & Joanne you'll love ALDI! I shop at 2 grocery stores but the bulk of my items are from ALDI. I love their produce and Friendly Farms Dairy products. And their Bakers Corner baking products OH MY are my favorite and such a great variety. They even have Organic baking products and I can't afford those unless I get them at ALDI. Teach80, I agree you cannot beat their prices on organics and I will have to try those pretzels. Anonymous, I'm sure the prices do vary by area and state. Pecans are way overpriced here in Texas, so I'm glad that I can get a 10 oz bag for $3.99. Some of our other retailers charge way too much for pecans, so they're just not affordable for me unless I get them at ALDI. @Jan Lipi, maybe a one will open by your dad. I have one in Rockwall, TX and the other day I went to Greenville, TX which is 20 minutes east of me and they just built a brand new ALDI. I was so excited because now I have two AlDI stores within 20 minutes of my home.